Had been hearing a dog barking to the north of the house, down in the woods, along Billy Moore’s fence line, But every time I went down there — silence. Girl Dog went with me but didn’t alert on anything. 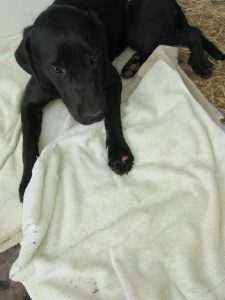 Finally the third day I searched and searched and found a young black lab, female, caught in a snare. It had cut deeply into her paw. She must have been there three days without food or water. So she is with me now and going to the vet tomorrow to check the paw. It is cut to the bone. Now I have to find a home for her. Girl Dog never paid her the slightest bit of attention, even when I carried her home in the golf cart — Girl Dog’s own golf cart! And so I have figured out how to avoid TSA’s groping — I will wear a hijab. I am not kidding. This entry was posted in News on February 9, 2017 by admin.